Highly effective method to deal with rat infestations. For use with rodenticides. Durable and shock resistant, the unit is lockable for child and animal safety. 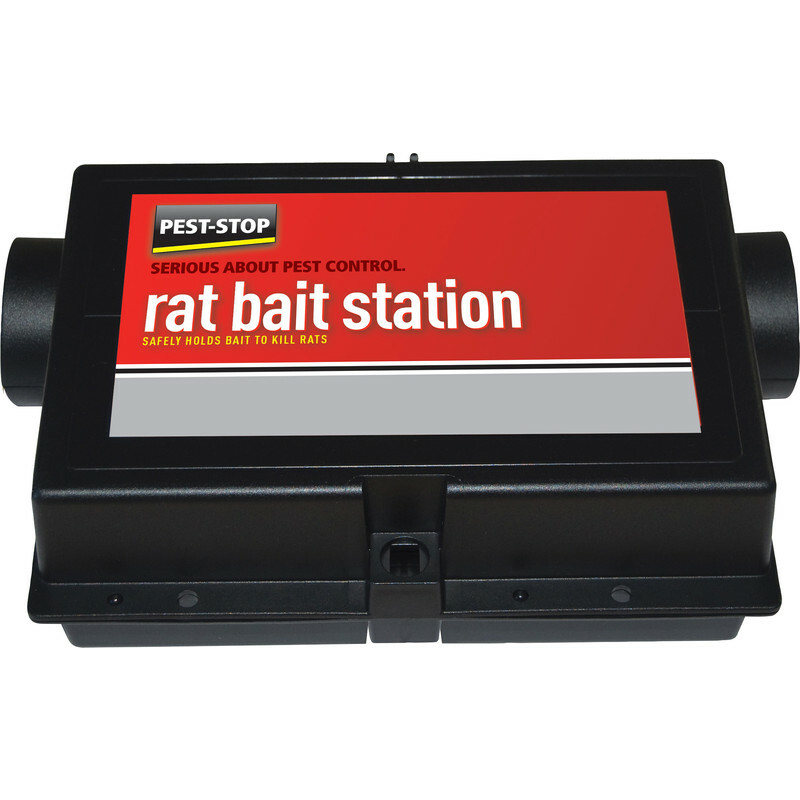 Pest-Stop Rat Bait Station is rated 3.7 out of 5 by 23. Rated 5 out of 5 by rodent killer from Rat Bait Station My order was delivered in under 24 hours. It was very simple to load with poison, and utterly safe for birds and pets. Hopefully, the rats have met their match. Rated 3 out of 5 by Ratty123 from Need to know about how to open the bait station I have bought a bait station today, but having read a review saying it wasn’t easy to unlock, I made sure I tried it in the shop. True enough, I couldn’t get it open nor could the two staff ! Another customer who is using a number of the bait stations showed us how to do it. The technique seems to be to turn the key while applying an upward push to the lid.....not easy unless you are aware. Can’t rate the product as not been tested yet. Rated 5 out of 5 by Tech Author from Does the job well Easy to use with several types of bait. We have no more rats! Rated 5 out of 5 by Anonymous from Just the Job! Excellent, safe, easy to use product. Rated 5 out of 5 by waltwales from simple but effective Bought this for use with the Pest stop 20g wax blocks & Works a treat. It has a simple bayonet style tamper proof lock (with large plastic removable key) which will inhibit access by children and definately pets (unless they enjoy eating large black plastic boxes!) Definitely recommended for use with rat bait. Rated 2 out of 5 by markemark from It's a plastic box It's a plastic box... I'm just not wholly convinced that you wouldn't be just as well buying a cheap tupperware box, popping a couple of holes in it with a hole saw and using that. I'm really struggling to see how the price can be justified for this moulded plastic box. Rated 5 out of 5 by Malcolm m from Does what it says Bought as we have a bird feeder and it attracts rats. Works well and keeps the poison away from other wild life. Also by far the cheapest on the market by a margin even allowing for buying poison separately. Ps it does not come with poison which has to be bought separately. But factoring this in it is still nearly half the price than other suppliers.